Shopping is different in China. There, it’s an integral part of social conversations, and it’s not uncommon for people to show each other what’s in their digital shopping carts at dinners and other gatherings. Online, Chinese retailers offer shoppers a significant amount of entertainment and content that keeps them interested and browsing for longer periods of time. Western shopping sites, by contrast, tend to be more transaction driven. Chinese shopping holidays are also unique, and less driven by promotions than Western shopping occasions are. During the annual November 11 (“Singles’ Day”) online shopping festival, Chinese shoppers watch a televised gala featuring celebrities and entertainers, play video games starring the Tmall cat mascot, and shop, shop, shop while being entertained. 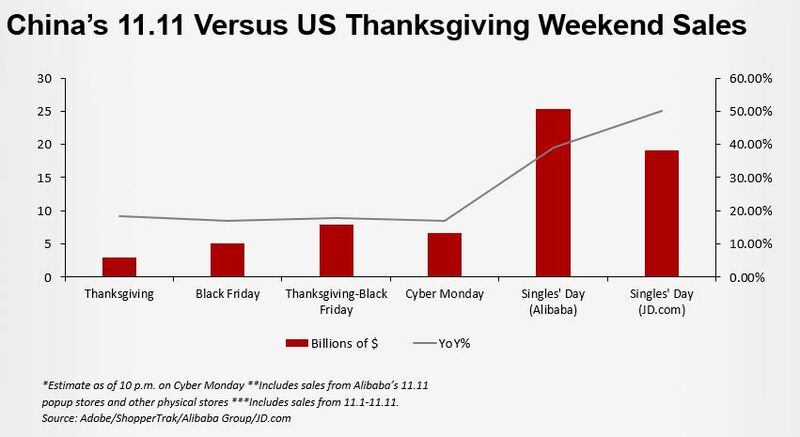 Last year on Singles’ Day, Alibaba alone generated $25.4 billion in sales—dwarfing Cyber Monday’s overall total of $6.6 billion in sales. Another difference is that Chinese consumers do the majority of their online shopping on mobile phones. On Singles’ Day last year, mobile accounted for 90% of online sales, a rate far higher than the mobile commerce rates regularly seen in the West. Chinese shoppers, especially those in second- and third-tier cities, have leapfrogged the desktop PC phase of online shopping and moved straight to mobile. China is quickly going cashless, too. When shopping in physical stores, Chinese consumers rarely pay with cash, and even street food and farmers’ market vendors accept mobile payments through the WeChat Pay and Alipay platforms. Beyond shopping, Chinese consumers can use digital payments for utility bills, taxi and subway rides, and many other services. 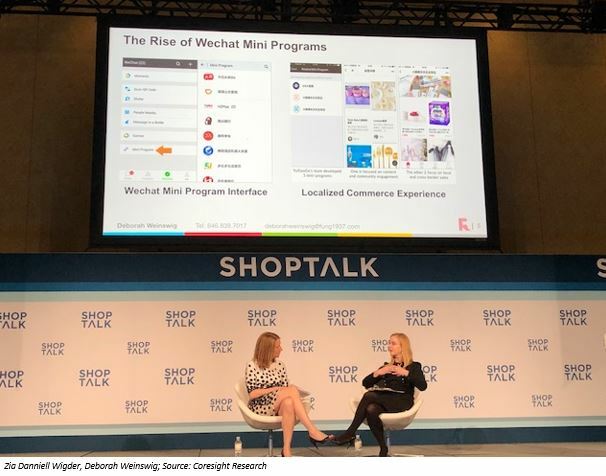 Shoppers in China also use their smartphones to access small retailers via WeChat Mini Programs. These low-memory, location-based mobile apps are embedded in WeChat, so users can open them easily instead of having to download and install separate retail apps. WeChat offers an open platform that allows businesses to access its ecosystem, negating the need for them to develop expensive, independent, full-function apps. Location-based Mini Programs allow users to search their vicinity to discover and interact with stores. There are some 580,000 Mini Programs available on WeChat and approximately 170 million people use them every day. As they travel around the world, Chinese consumers are exporting their shopping behaviors and preferences. On average, Chinese tourists travel twice yearly, and the number traveling overseas continues to grow and drive retail spending globally. By 2021, 192 million Chinese travelers are expected to spend $458 billion per year, according to the United Nations World Tourism Organisation. Much of the current growth in outbound travel is driven by newly affluent residents of lower-tier cities in China. They spend an average of $2,449 per overseas trip, 10% more than their peers from higher-tier cities, as they frequently make purchases on behalf of friends and family at home. China is also an emerging leader in artificial intelligence (AI), and the country is deploying the technology in retail and other sectors. The size of the Chinese population means that there is a tremendous amount of data available to calibrate AI systems. Moreover, the Chinese government is very supportive of AI development. In 2017, the government announced that it seeks to lead the world in AI technology by 2025. The plan specifically identifies AI as the main engine of China’s progress toward becoming a major economic power and lays out plans for the AI industry to grow to ¥1 trillion by 2030. The retail industry in China has evolved separately from the industry in the West, and it has accomplished many of the goals that US retailers are still striving toward, including combining shopping with entertainment and making shopping and payment as frictionless as possible. While the ease of sharing via social media has enabled consumers all over the world to seek recommendations and compare purchases with friends and family, in China, it has helped turn shopping into a group activity that’s fun to participate in, like a team sport.